What does it take to make you feel “high”? Do you routinely reach for caffeine, alcohol, cigarettes, or sugary snacks to get you through the day? Unfortunately, the quick fixes we have become accustomed to don’t work long-term, and often contribute further to the underlying problems of fatigue, depression, brain fog, and anxiety. In Natural Highs, two leading authorities in psychology and nutrition present a prescriptive breakthrough program based on nutritional supplements, herbs, and simple mind-body therapies that will help to increase energy, sharpen the mind, elevate mood, relax the body, and beat stress. 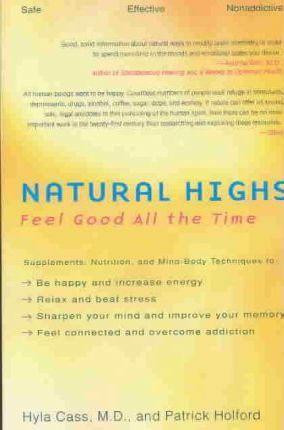 Their remarkable research shows how to formulate the perfect “brainfood” to improve how we think and feel, resulting in a greater sense of connection and joy in everyday life-the natural high.